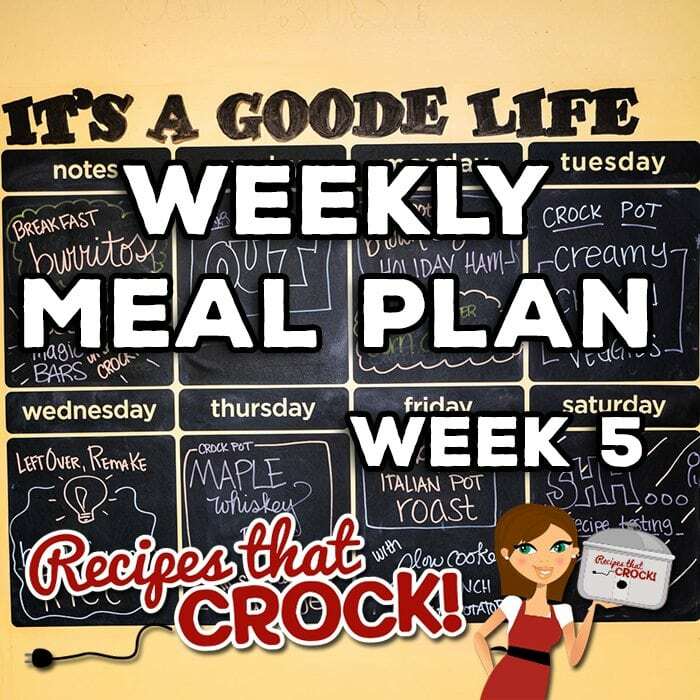 Weekly Meal Plan - Week 5 - Recipes That Crock! 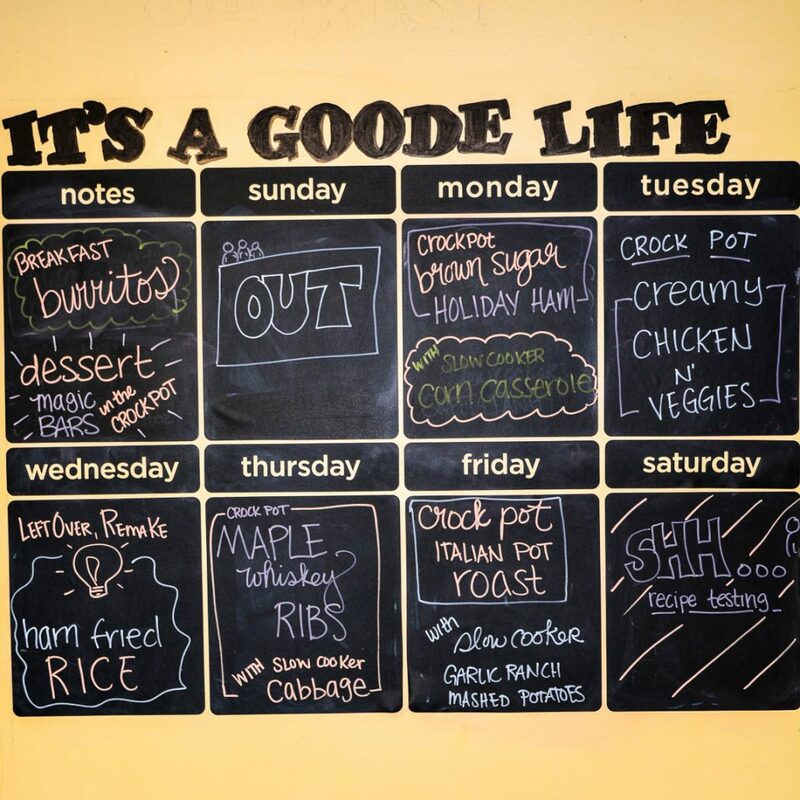 This week’s Weekly Meal Plan includes Crock Pot Brown Sugar Holiday Ham, Crock Pot Corn Casserole, Crock Pot Creamy Chicken and Veggies, Ham Fried Rice, Easy Crock Pot Maple Whiskey Ribs, Crock Pot Old Fashioned Cabbage, Crock Pot Italian Pot Roast, Crock Pot Garlic Ranch Mashed Potatoes, Freezer Breakfast Burritos, and Crock Pot Magic Bars! As you know, we are including the weekly meal plan each week in our regular weekly chat on YouTube. Below is the full show where we answer reader questions. Each week our meal plans will include a breakfast, a dessert and then full meals for Mondays, Tuesdays, Thursdays and Fridays. That is because we test recipes on the weekends so they aren’t ready to share yet… and then we always have leftovers on Wednesday because otherwise it is way too much food for our family. Feel free to pick and choose from what we are eating this week to build your own meal plans. Monday we are having Crock Pot Brown Sugar Holiday Ham and Crock Pot Corn Casserole. Tuesday we are having Crock Pot Creamy Chicken and Veggies. Wednesday is leftover day at our house. We totally need a day in the week to make sure we don’t waste food. If your family needs a new recipe for this day of the week, I highly recommend trying our Ham Fried Rice. Thursday we will be chowing down on Easy Crock Pot Maple Whiskey Ribs and Crock Pot Old Fashioned Cabbage. Friday we are eating the Crock Pot Italian Pot Roast with these Garlic Ranch Crock Pot Mashed Potatoes. We take the weekends off from regular cooking. We usually go out to lunch for family time and the rest of the weekend we test recipes to share with you in future posts ;). For breakfast, we will be having a family favorite, Freezer Breakfast Burritos. For dessert this week, we will be making up a long-time favorite around here, except in a crock pot: Crock Pot Magic Bars. What are your meal plans this week? Do you ever publish heart healthy crock pot recipes? My husband recently had heart surgery and it’s time to change what we eat. I am sure there are recipes on the site to fit every diet or recipes that could be altered, but I would reach out to your family doctor and ask for specific tips to alter recipes to make them more heart friendly. In the meantime, the American Heart Association does have a Healthy Slow Cooker Cookbook out there that I really like. Here is a referral link to it on Amazon: http://amzn.to/2dNQ6QB . Hope that helps!